The main objective of the project is to implement a novel advanced technology for the high-resolution environmental impact assessment. The technology consists of three integrated modules: (A) citizen observations and data fusion; (B) satellite remote sensing; (C) high-resolution urban modeling. The technology has been successfully demonstrated in Bergen (Norway) and Helsinki (Finland) with different technical realizations of the A-B-C components and data sources. It assures flexibility and transferability of the approach. The proposed technology is a joint development of the project partners based on the accumulated knowledge and understanding of the specific environmental phenomena in the cold climate (stably stratified atmosphere, snow and ice processes, polar clouds, permafrost), which result in large errors and uncertainties when more general approaches are being regionalized. Synchronize the latest state-of-the art knowledge and technology development among partners. Organized workshop will result in a report and a joint peer-review overview publication. Set up the analysis algorithms and models with geographical data (surface morphology, DEM, emission inventory) from the North West Russia, specifically, from the Apatity-Kirovsk area. Updated open data and parameter sets for the project and other user consortiums can be expected. Implement the proposed technology for the Apatity-Kirovsk area aiming for the historical (since 2000) environmental changes and local climate features. It results in testing and demonstration of the technology. Engage an undisclosed circle of end-users, decision-makers, stakeholders (from companies, city administrations, research groups) with the project through demonstration of the historical analysis. White papers on end-user needs and working routines will be prepared. Implement the proposed technology for impactful scenarios selected from the prepared white papers. Emphasis on the broad outreach activity to rise societal awareness about the novel technology of the optimal environmental management. Extend the technology to transboundary environmental impact and pollutant transport, incorporating simulations with a larger-scale meteorological model. Results would disclose the needs for international collaboration and cooperation for sustainable development. Increase capacity for dealing with ecological disasters and emergences through establishment of sustainable networks with partners and users, utilizing the documented experience with such networks in Bergen and Helsinki. Listing of necessary data, tools, computer resources. Deliverable: fully functional research network with web-based portal support. 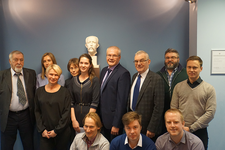 The project workshop took place 22-24 January 2018 in St. Petersburg (NIERSC). Materials of the starting workshop are here. News about the workshop were available at the NERSC Facebook, Twitter and at the PEEX sites. The PEEX site also lists the project here. Automation in-situ citizen observation data collection and analysis demonstration of implementation of data fusion through geo-statistical algorithms with external drift from models; set-up of models, obtaining specific to urban area in focus the aerodynamical, morphological, land-cover/use, terrain, etc, characteristics for fine scale simulations and other geographical parameters. Deliverable: Data fusion software and geographical data sets for Apatity-Kirovsk area. Historical data analysis, remote sensing data analysis, demonstration of SMEAR multi-level measurement capabilities and demonstration of off-line vs. on-line approaches for models simulations with downscaling chain (from hemispheric-regional-subregional-to-urban scale in focus). Deliverable: observational and modeling data sets, the analysis report, demonstrator/ prototype of downscaling modelling chain (on historical examples) as potential service. Extend the technology to transboundary environmental impact and pollutants atmospheric transport; finalize simulations for selected user-oriented scenarios; EC-Earth simulations on large-scale aerosol-chemistry-cloud-climate interactions in the study region. Publish and disseminate the networking activities results; finalize and submit the paper; demonstrate the technology with the Apatity-Kirovsk case study. see the project publications and dissemination products [here]. Follow-up of the project is facilitated by the long-term strategic collaboration established between the partner institutions. NERSC and NIERSC are working together for more than 25 years, developing remote sensing and modeling technologies. Follow-up this project, NIERSC and KSC will be possess the assessment and further develop the modeling and data analysis components. KSC and SRCES will extend the case studies to other Russian urbanized areas, e.g. to Murmansk, Vorkuta, Nadym and Novy Urengoy where the dense observational networks are already deployed and plans for implementation has been agreed within other projects/proposals. UHEL will follow the project with analysis of data of new SMEAR stations installed in Russia. The further work of NERSC, NIERSC, UHEL and KSC is supported by ongoing international project EU INTAROS, Belmont Forum HIARC and by the Pan-Eurasian Experiment. We consider the project as successful when it demonstrate that the proposed technology is working in the Apatity-Kirovsks case study. It should be documented in the final technical report (both English and Russian versions). The research part of the project will be reported in one peer-review publication of the participants. The transboundary transport scenario studies will be reported in the technical report of UHEL. The collected data and quantitative analysis will be described and make publicly available through the NERSC ftp server. The communication part of the project could be evaluated through the issued white papers of the end-user request to the high-resolution urban environmental assessment. The outreach activity could be evaluated through the number of media events (2-3) and popular publications (2-3). The full project description is avaialble here.